In the period from 1893 to 1896 America suffered a severe economic meltdown that was surpassed in its tragic impact only by the Great Depression that followed four decades later. The causes were complex. They included a public panic to cash in paper currency for gold, a subsequent depletion in the country's gold reserve and bankers calling in their loans to private industry as the value of the dollar continued to decline. A domino effect resulted as major companies such as the Northern Pacific Railway, the Union Pacific Railroad, and the Atchison, Topeka and Santa Fe declared bankruptcy. An estimated 15,000 companies failed. The price of farm products plummeted, forcing many farmers to loose their farms and their livelihood. The crush of so many defaulted loans led some 500 banks to close their doors � taking their depositors' life savings with them. Unemployment soared. There was no government assistance. In Ohio, Jacob S. Coxey – owner of a failed business – decided to take matters into his own hands. In a move that foreshadowed the Bonus Army of 1932, he began a march on Washington in order to force the government to provide relief for the unemployed. As he made his way to the capital he was joined by what he proclaimed was an army of 100,000 destitute. However, when he entered the city he had a following of only 500. His plea fell on deaf ears as both the President and Congress refused to meet his demands. 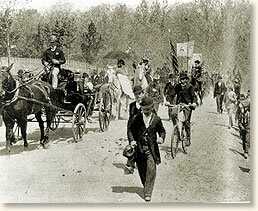 Coxey and his followers were subsequently arrested for trespassing. The nation’s roads and railways were filled with the unemployed searching for a better life. They became hoboes, panhandling their way across the country in search of a job. Among them was eighteen-year-old Jack London, future author of Call of the Wild (1903). "Thirty days, said his Honor, and called another hobo's name." "The town was asleep when I entered it. As I came along the quiet street, I saw three men coming toward me along the sidewalk. They were walking abreast. Hoboes, I decided, like myself, who had got up early. In this surmise I was not quite correct. . . The men on each side were hoboes all right, but the man in the middle wasn't. . . At some word from the man in the centre, all three halted, and he of the centre addressed me. He was a 'fly-cop' and the two hoboes were his prisoners. 'What hotel are you stopping at?' he queried. 'I just arrived,' I said. I was 'pinched.' I knew who wanted to see me. With that 'fly-cop' and the two hoboes at my heels, and under the direction of the former, I led the way to the city jail. There we were searched and our names registered. I have forgotten, now, under which name I was registered. From the office we were led to the 'Hobo' and locked in. The 'Hobo' is that part of a prison where the minor offenders are confined together in a large iron cage. Since hoboes constitute the principal division of the minor offenders, the aforesaid iron cage is called the Hobo. Here we met several hoboes who had already been pinched that morning, and every little while the door was unlocked and two or three more were thrust in on us. At last, when we totaled sixteen, we were led upstairs into the courtroom. . . In the court-room were the sixteen prisoners, the judge, and two bailiffs. The judge seemed to act as his own clerk. There were no witnesses. There were no citizens of Niagara Falls present to look on and see how justice was administered in their community. The judge glanced at the list of cases before him and called out a name. A hobo stood up. The judge glanced at a bailiff. 'Vagrancy, your Honor,' said the bailiff. 'Thirty days,' said his Honor. The hobo sat down, and the judge was calling another name and another hobo was rising to his feet. The trial of that hobo had taken just about fifteen seconds. The trial of the next hobo came off with equal celerity. The bailiff said, 'Vagrancy, your Honor,' and his Honor said, 'Thirty days.' Thus it went like clockwork, fifteen seconds to a hobo and thirty days. They are poor dumb cattle, I thought to myself. But wait till my turn comes; I'll give his Honor a 'spiel.' Part way along in the performance, his Honor, moved by some whim, gave one of us an opportunity to speak. As chance would have it, this man was not a genuine hobo. He bore none of the ear- marks of the professional 'stiff.' Had he approached the rest of us, while waiting at a water-tank for a freight, we should have unhesitatingly classified him as a 'gay-cat.' Gay-cat is the synonym for tenderfoot in Hobo Land. This gay-cat was well along in years � somewhere around forty-five, I should judge. His shoulders were humped a trifle, and his face was seamed by weather-beat. For many years, according to his story, he had driven team for some firm in (if I remember rightly) Lockport, New York. The firm had ceased to prosper, and finally, in the hard times of 1893, had gone out of business. He had been kept on to the last, though toward the last his work had been very irregular. He went on and explained at length his difficulties in getting work (when so many were out of work) during the succeeding months. In the end, deciding that he would find better opportunities for work on the Lakes, he had started for Buffalo. Of course he was 'broke,' and there he was. That was all. 'Thirty days,' said his Honor, and called another hobo's name. Said hobo got up. 'Vagrancy, your Honor,' said the bailiff, and his Honor said, 'Thirty days.' And so it went, fifteen seconds and thirty days to each hobo. The machine of justice was grinding smoothly. Most likely, considering how early it was in the morning, his Honor had not yet had his breakfast and was in a hurry. He got to me. My name, whatever it was, was called, and I stood up. The bailiff said, 'Vagrancy, your Honor,' and I began to talk. But the judge began talking at the same time, and he said, 'Thirty days.' I started to protest, but at that moment his Honor was calling the name of the next hobo on the list. His Honor paused long enough to say to me, 'Shut up!' The bailiff forced me to sit down. And the next moment that next hobo had received thirty days and the succeeding hobo was just in process of getting his. When we had all been disposed of, thirty days to each stiff, his Honor, just as he was about to dismiss us, suddenly turned to the teamster from Lockport � the one man he had allowed to talk. 'Why did you quit your job?' his Honor asked. 'Thirty days more for quitting your job,' said his Honor, and the court was closed. That was the outcome. The teamster got sixty days all together, while the rest of us got thirty days. London, Jack, The Road (1907). "Hobo 1894: Hard Times in America", EyeWitness to History, www.eyewitnesstohistory.com (2007). London spent 30 days in the Erie County Penitentiary located in Buffalo for his crime. 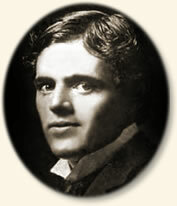 Jack London died at his ranch in California on November 22, 1916. Many have attributed his death to suicide, however, evidence points to renal failure.